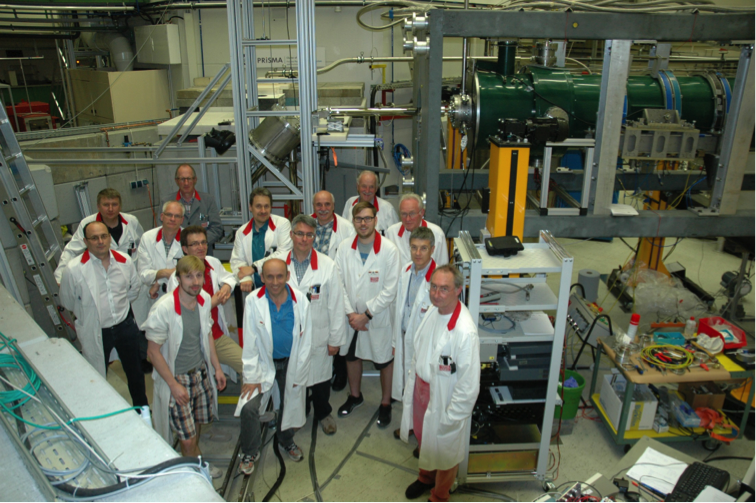 For the User Facility at the research reactor TRIGA Mainz – one of the key facilities of PRISMA – first experiments with ultra-cold neutrons (UCN) were recently carried out in a three weeks long beam time. The experiments were dedicated to the production, transport and subsequent storage of ultra-cold neutrons. For this, the TRIGA Mainz was operated in a two-shift mode for a total of three weeks. At the radial beam port D of the TRIGA Mainz ultra-cold neutrons were produced via the interaction of thermal neutrons with a solid deuterium crystal kept at 5 K (-268°C) by means of cryogenic cooling with liquid helium. The latter was provided by the newly installed helium liquefier as part of the structural initiative of PRISMA to sustain long-term experiments with ultra-cold neutrons. In pulse mode operation with a maximum peak energy of 10 mega joule, the solid deuterium converter remained stable for the whole 3 weeks period and showed no deterioration of the cryo-crystal that has a direct impact on the ultra-cold neutron yield. Tests with different neutron guides and storage volumes were performed for the optimization of the transport and storage efficiencies outside the biological shield at the experimental area. Furthermore, after a reactor pulse the ultra-cold neutrons were successfully guided from the horizontal exit of the source upwards for gravitational deceleration and injected into the magnetic trap of a superconducting magnetic spectrometer (t-SPECT apparatus), specially designed for the precise measurement of the neutron life time. UCN team and reactor staff in front of beam port D. The superconducting magnet (green, top right) is lifted up to a height of about 1.5 m above the exit of the source for an optimum matching of the energy spectrum to the needs of a storage experiment.